A Conversation with our own Muriel Martinez, O.D. Home » What's New » A Conversation with our own Muriel Martinez, O.D. 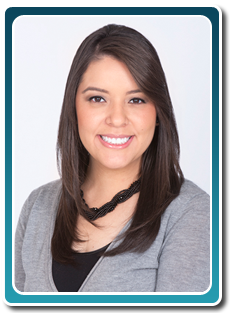 Dr. Martinez is our newest doctor, having joined Lifetime Eyecare Associates in 2014. We are very fortunate to have her on our team. What brought you to The Woodlands area and to Lifetime Eyecare Associates in particular? The Woodlands is a continually growing community and Lifetime Eyecare Associates is preparing to grow along with the community in order to best serve its population. I believe that children are an important part of a growing community, therefore I wanted to bring my highly specialized services to The Woodlands. Tell us about your family, and what you like to do in your spare time. I am originally from Honduras, Central America but most of my family currently resides in New Orleans. I have 5 siblings who live throughout the American continent (from Brazil to the U.S.) –so I understand Portuguese, Italian, and am fluent in Spanish. I am married to a wonderful husband and have a dog, both which I love. I enjoy staying home and working on projects such as scrapbooking, painting, crafts, photography, and baking. I also enjoy playing the flute, piano, and guitar. What interests or excites you the most in the field of optometry? I enjoy the variety that is within Optometry such as Low Vision, Pediatrics, Disease and Contact Lenses. There is so much you can do to help your patients and I really enjoy it! I also enjoy spending time and getting to know my patients and their families. Your passion is Pediatric Eyecare. How did you become interested in this and what kind of special training did you have? I have always loved working with children; therefore it was easy to choose a residency that trained me in pediatrics and brain injury. Children are many times unable to accurately describe what is wrong with their vision, and because of my extensive training I am able to be their advocate in times when there is a complex binocular vision disorder or when a simple spectacle correction is required. I received my pediatric and brain injury (neurology) training at The University of Houston College of Optometry. I spent a year specializing and working with special needs children, brain injury children and adults, as well as encountered a variety of binocular vision disorders and childhood ocular diseases. I have also been able to train and observe alongside many renown pediatric ophthalmologists from the greater Houston area. My neuro/brain injury training encompassed training at The College of Optometry and The Texas Institute of Rehabilitation and Research (TIRR) in the Medical Center. TIRR is a hospital where I was able to provide bedside eye exams to patients who had recently suffered from traumatic brain injuries (TBI). I was therefore exposed to a multitude of eye disorders such as visual field loss and binocular vision disorders that accompany TBIs. I was also exposed to a variety of multi-systemic disorders that accompany patients who have suffered a traumatic brain injury. How do you stay ahead of the latest vision technologies? I am very lucky to be part of Lifetime Eyecare Associates, specifically for this reason. There are always new devices and technology which help practitioners provide the best eye care with the latest technology—and we have them here at Lifetime Eyecare. I also try to stay up to date by attending a variety of continuing education meetings that provide guidance and knowledge about the new advancements in Optometry. You received a prestigious award from the American Academy of Optometry (AAO) as well as from The American Optometric Foundation (AOF). Can you tell us more about that? In November 2014 I was awarded my Fellowship to The American Academy of Optometry as well as The Terrance N. Ingraham Pediatric Optometry Residency Award. In qualifying for and maintaining fellowship to the Academy, individuals are evaluated against the highest standards of professional competence. The letters "FAAO" (Fellow of the American Academy of Optometry) after an optometrist's, scientist’s or other qualified person's name signify to colleagues and patients that rigorous qualifications for fellowship have been met. •Optometrists who are licensed to practice at the highest level permitted by law in their jurisdiction. •Scientists, educators, librarians, administrators, and editors who have accredited themselves and optometry by their contributions to optometry or vision science. The Terrance N. Ingraham Pediatric Optometry award is given yearly to only three pediatric residents in the United States. The Terrance N. Ingraham Pediatric Optometry Residency Award is intended to promote the practice and development of the field of Pediatric Optometry by providing incentive and support to talented optometric residents who demonstrate a passion and commitment to practice, research, and education in the field of children's vision. The goal of this award is to invest in the evolution of the field of pediatric optometry, particularly but not limited to the application of soft contact lenses for children's vision disorders, by providing opportunities for future practitioners, educators, and researchers. What other specialties have you developed in optometry? Children that are born with or develop cataracts require complex contact lens fittings after they have had a cataract surgery. During my pediatric residency training, I was able to fit many of these children and infants in a variety of contact lenses. I also have been able to do rotations through Optometry locations around the Houston area that have high exposure to ocular disease such as The Eye Center of Texas. Here I learned a variety of co-management strategies as well as the latest treatment regimens for many ocular diseases including glaucoma, cataracts, lasik and diabetic retinopathy.